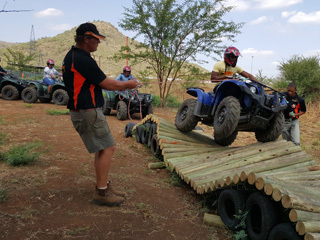 Experience the thrill of driving a Quad in low range 4X4 through a course of challenges including: …amongst others. 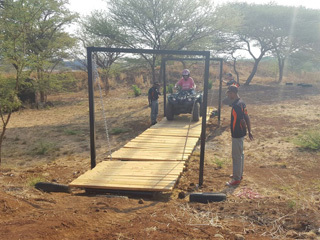 To ensure safety we have guides walking along with safety ropes. 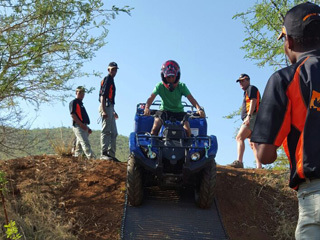 No previous experience necessary for this exciting adrenaline adventure. This product is a new global craze. 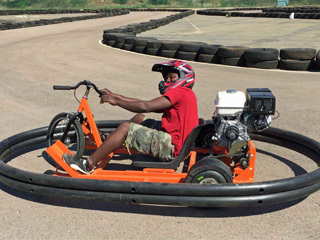 Similar to a go-cart, but with only 3 wheels, the Drift Trikes are also powered by an engine. 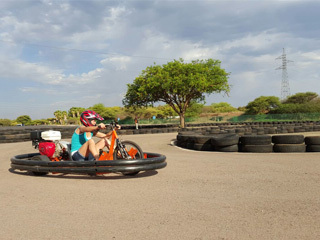 The smooth plastic lining on the back wheels makes the difference, and allows the client to experience the thrill of drifting the trike around a go-cart circuit in a race. 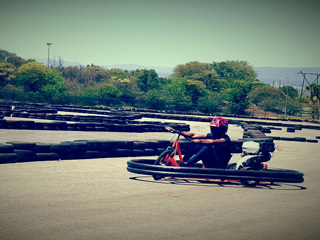 A wow and safe experience with a good dose of adrenaline! 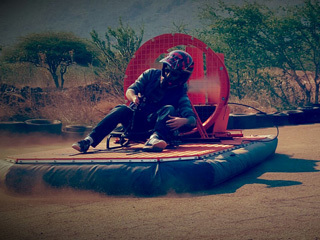 Small one man hovercrafts elevate the client to float on a cushion of air. The steering is done via rudders, resulting in a delayed steering response. 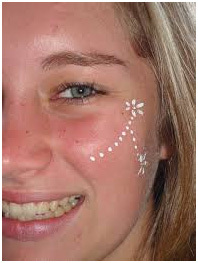 This provides a challenge to adapt to, combined with a floating sensation. Like a brick spinning on ice! 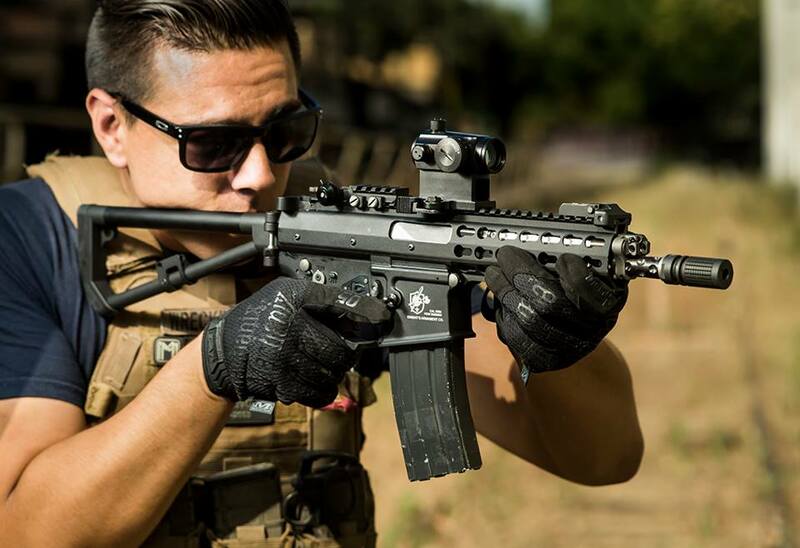 Experience the thrill of a close quarter combat adventure! 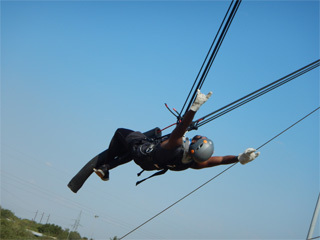 This is a high impact adrenaline product, similar to bungee jumping. 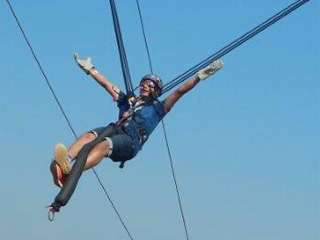 The client gets strapped into a safety harness and attached to the top of two long poles with bungee cords, like a giant catapult. 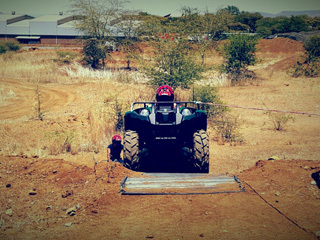 The client is strapped to the back of a quad bike which is driven away from the poles. At a final position the client is released. 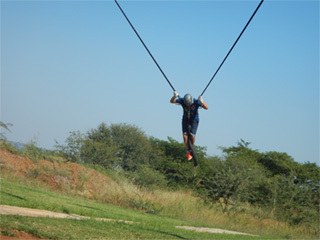 The result is a safe yet adrenaline filled catapulting action between the two poles! 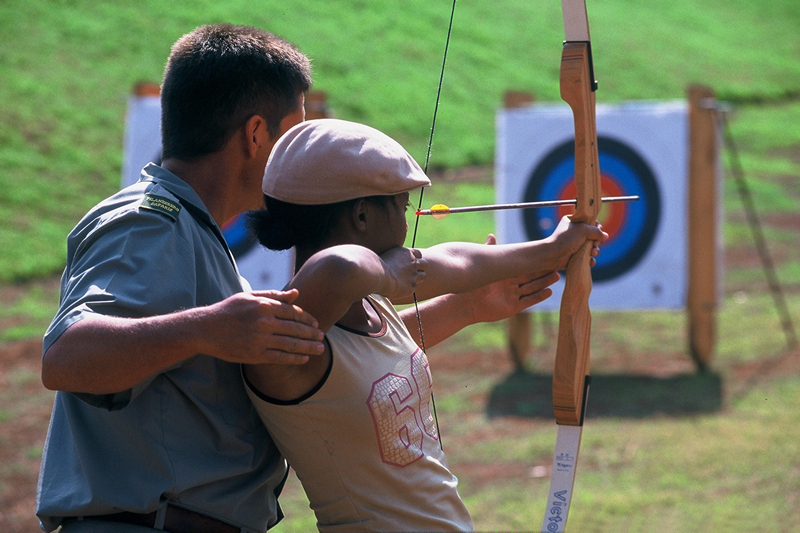 Participants have to interact to cross an imaginary river, or start a fire with very few resources, use a bow to shoot a target for meat. 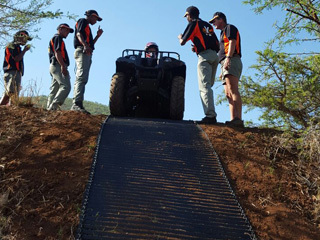 Drive a quad through a set of challenging scenarios such as – across a hang bridge, over a mountain of tires etc. 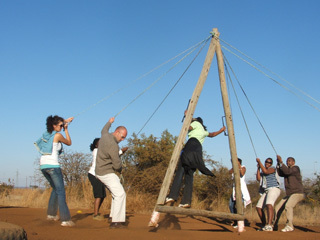 This program includes a wide variety of possible Teambuilding modules to choose from. This is a great activity for really getting the team dynamics going and normally last for 3 Hrs. 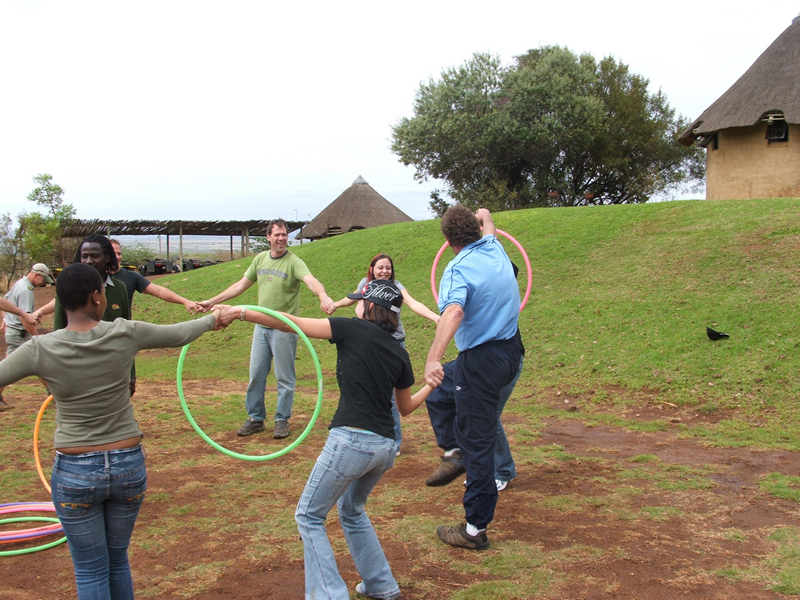 This more affordable Teambuilding program includes various Teambuilding modules. The normal program duration is 2 Hrs. 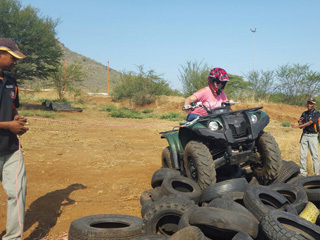 Group is divided into smaller Teams that compete against each other in this program. 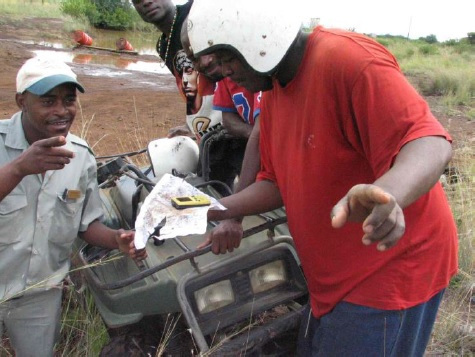 Team members receives clues and instructions via sms on their personal cell phones. Duration 2 Hrs. 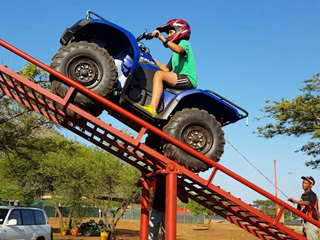 The principle aim of this activity is to offer a program that is highly affordable at basic level, yet is also modular and can be evolved to different levels of experiential entertainment depending on the client’s needs.The Challenges are presented via Sms’s to every client’s cellular phone. Clients have to solve riddles and challenges as quick as possible. 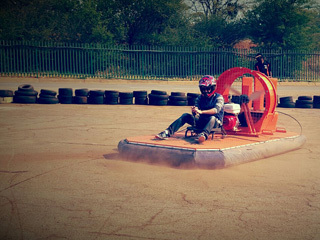 These challenges are scattered over the Sun City Complex. The tasks to be completed at every location can be modularly expanded to involve e.g. 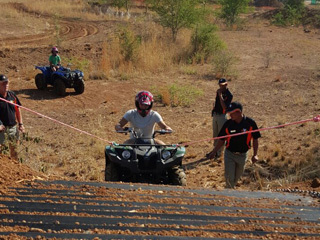 ; Quad Bikes precision driving challenge, Archery hunting challenge, Drumming rhythm composing to satisfy a judge, Paintball gun shooting, etc. 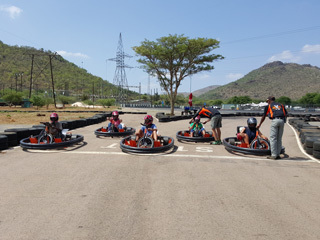 The duration of the full race is 3 hours. If Robin Hood can do it, So can You! 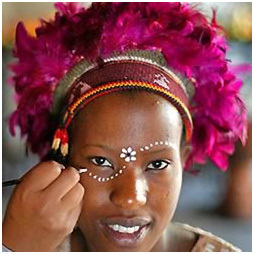 Let your Cultural talents take over and Inspire the people. Drums have been played in Africa for thousands of years. 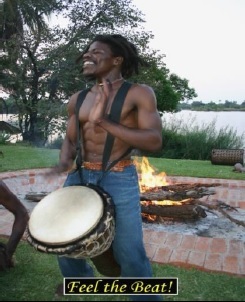 So what better way of exposing your clients to the rich enjoyment and fulfilling experience of African drumming, than by giving them each a hand crafted Djembe drum to play. 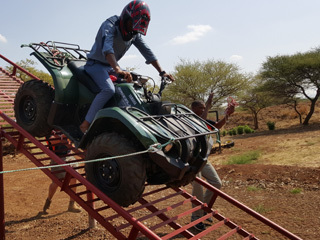 Our various sessions are designed and led by a team of dynamic young facilitators who put emphasis on building spirit and team work in the group. The event is started with a cacophonous rumble to show the guests the chaotic possibilities of not working together. Only then do we build them level by level, until they are beating out thunderous African rhythms as a group. 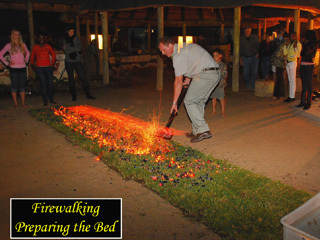 The interactive drum experience is the perfect way to add dimension to your conference opening, break away time or bush braai (barbecue). Our session lasts for about an hour. 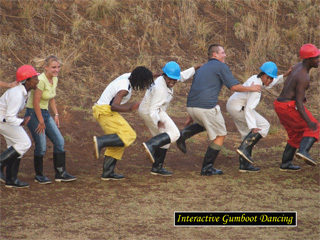 Gumboot Dancing is a hallmark of traditional South African mining culture; It originated in the gold mines of Johannesburg, deep down in the shafts. The miners used the sounds of stepping together, smacking their boots, clapping their hands and dancing together to create a gumboot dance rhythm to distract them from the long treacherous hours beneath the ground and to operate as a team, so where better to learn this than right here in the heart beat of the Mining industries. 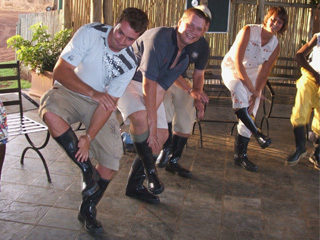 Interactive gumboot dancing unleashes energy to any event. 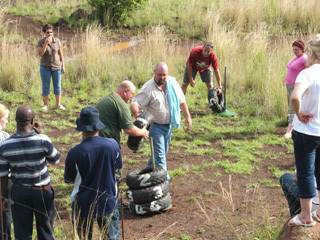 We provide each person with a pair of gumboots and within a few minutes with our team’s help, the group will be grooving and stamping together. Delegates to bring along their own socks. 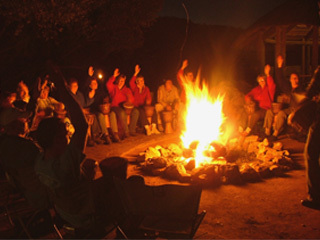 Your team will be divided into two separate groups. The sequence will be taught to the delegates. One group learning drumming the other the gumboot dancing. In the end they will work together as a whole, performing their own “industrial theatre”. 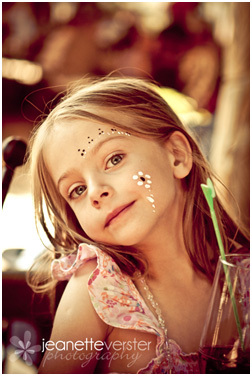 This 5-piece ensemble is a stunning way to keep guests entertained during a bush braai or gala dinner. 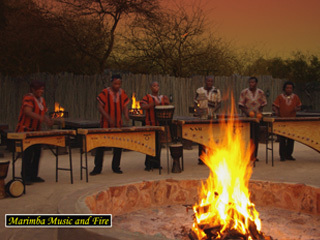 The band consists of three professionally handmade Marimbas (traditional xylophones). These are made of wood and give an incredible “earthy” sound. 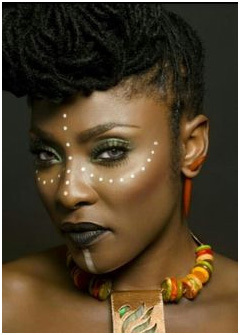 Very African, very good. Accompanying the marimbas are two percussionists who provide the pulsating beats to which the band plays a range of African music. 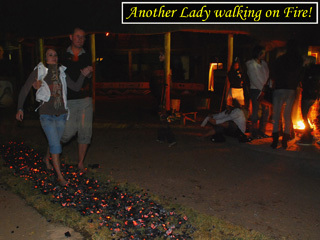 From traditional African melodies, Reggae, Jazz as well as some of our own unique compositions, this is a great way to experience Africa’s vibrant musical culture. 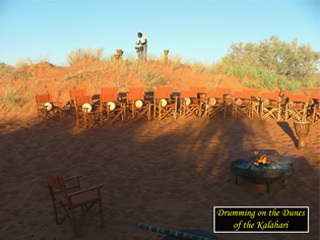 The session lasts about one hour and is punctuated by song and drum performances. We can also split the session to allow for some variance in the program. By prior arrangement we can also increase the band size from five, to up to eight performers. The power and majesty of African dance… Throughout the ages, dance has been one of the most fundamental expressions of African vibrancy and creativity. The reasons are simple; Dance uplifts and energizes the community. Dance invigorates and prepares the warriors for battle, and above all dance bridges the gap between the ancient and modern. It keeps the stories and legends alive for the generations yet to come. 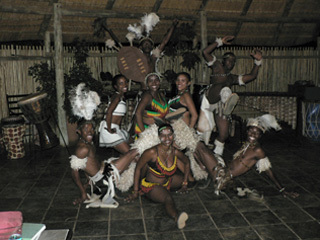 Our dance troupe is an eclectic mix of contemporary and traditional. 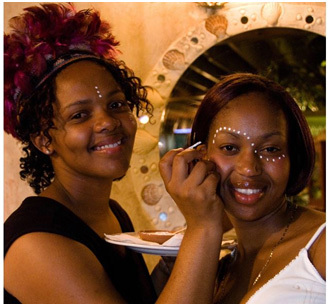 We pride ourselves on developing and delivering on what is undoubtedly Africa’s finest heritage. 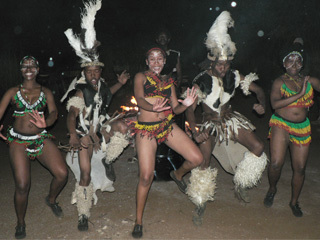 The performers are local, dynamic young men and women who perform both their own Tswana dances as well as the more mainstream Zulu shows. 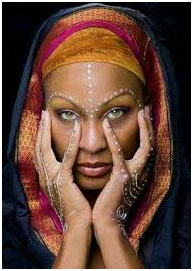 Contemporary African dance is included as it gives our performers freedom to experiment and developed as artists. The troupe is between five and eight members strong. The spectacle is best complimented by our Marimba band but it works well as a standalone event i.e. welcome band, fringe or main performance. 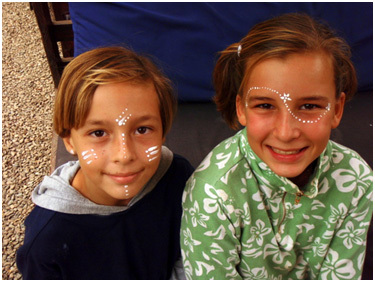 This exciting entertainment combination will entertain you and your guests with the wonderful sounds of Africa. 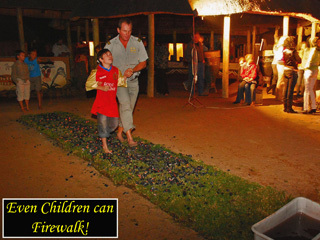 Begin the evening with traditional tribal dancing and singing incorporating many elements from all the South African cultures like Zulu Stick Fighting and Gumboot Dancing. Artists from the local community, brilliantly perform this exhibition. 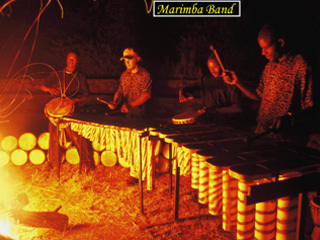 The melodic sounds of our Marimba Band will complete any bush boma under the African stars. 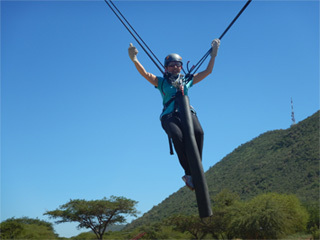 Adrenaline Extreme can tailor this experience to your specific group needs and ensure an unforgettable dining experience. 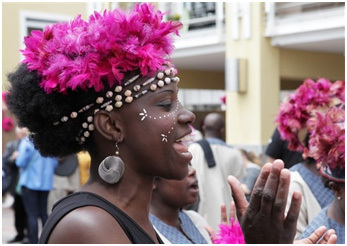 Together with our tribal dancers and marimba band, you will be introduced to the art of dancing, clapping and singing rhythms, while you celebrate the privileged to be part of the human race. 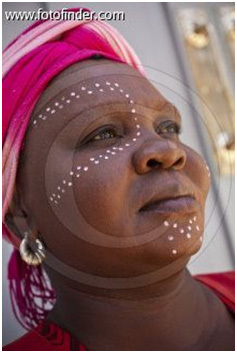 This presentation of truly African music will wow any local or overseas visitor. Duration of this combo will be +- 2 hrs.